A few saffron strands (10) soaked in 1 cup of water. Pour the milk in a pan and keep it in medium low. Add sugar, cardamom powder, grated almonds mixture. When milk is ready to boil add saffron water along with saffron strands. Boil the milk and separate it in two portions. Separate 1/4 cup milk from the pan and heat separately in low flame. Add condensed milk till the milk thickens. 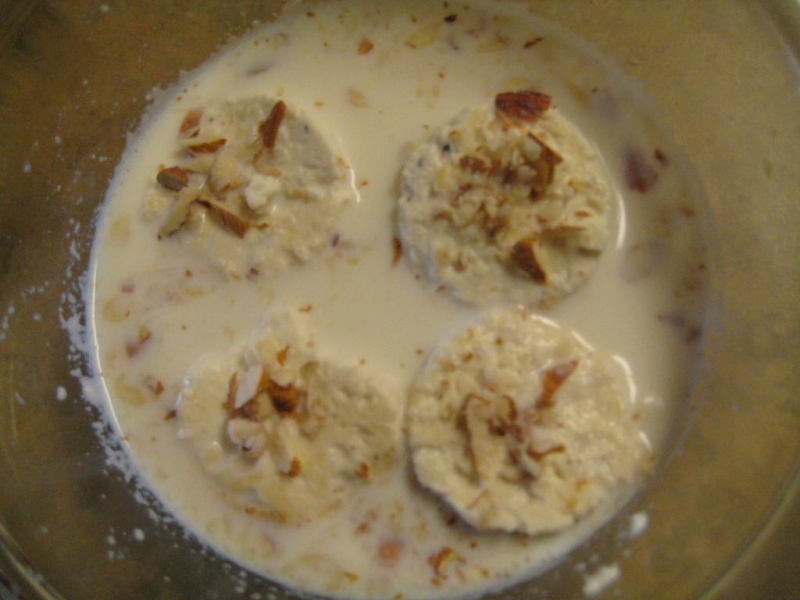 Serve in Individual Bowls with thickened milk and garnish with few saffron strands and chopped almonds. Cool down the milk and refrigerate it. To the rest of the milk (3/4 portion), add lemon. After milk is all curdled up and is all separated from water, sieve the cheese and take out in an oven tray. Place the cheese in the oven for 15 minutes 350 degrees or less depends on oven to oven (cheese should not change brown color). Take out the cheese and rest it for 10 mins till it cools down, then cut the cheese in circles with help of cookie cutter or any round shape cutter. Put 1-2 drops of Kewra liquid on each and every cheese balls and refrigerate them for an hour. I tried this recipe when some friends visited us...& it turned out very well!! It was so easy to cook & testy too. I received complements for my cooking!! Thanks a lot! I tired this, i never thought it will be that easy.I am afraid of cooking, coz i always ruin my food.Thanks for easy recipe.I will make again for my mom now, she likes Rasmalai so much. Oh my God , i tried it and its sooooo simple..My family loved it and totally convinced..that i can cook..these things...its soo homemade..n easy one..thanks for the recipe..looking forward for more from you.